Hard as it is to believe, Quills is in its sixth year of creating coffee goodness in the Louisville area. In the last 18 months alone, we have opened two new stores and begun selling our own freshly roasted coffee regionally to grocers and other cafés as well as nationally on the web. As we’ve come to believe and say around here: Great coffee enhances your life. We savor the chance to slow down and enjoy something that has been handled with care in every step of the process; Something that presents such complex and varied flavors. As we have pursued this passion, we’ve seen the need to continue to push further toward bringing the best, most life-­‐enhancing coffees we can to this energetic community of coffee drinkers and makers in Louisville, New Albany, and beyond. More broadly- the coffee industry as a whole continues to evolve and grow, moving beyond a mere commodities market to a specialty industry in its own right; One that provides a product that not only enhances our lives but brings a sustainable future to those who grow it and brew it. Additionally, in the past year, we have had many exciting conversations both with our current coffee importer and with numerous others who are inviting us not only to pursue even better coffees but to get even closer to the farmers who produce them. As these new opportunities come along, we want to boldly step into them and take you - our invaluable patrons - with us. 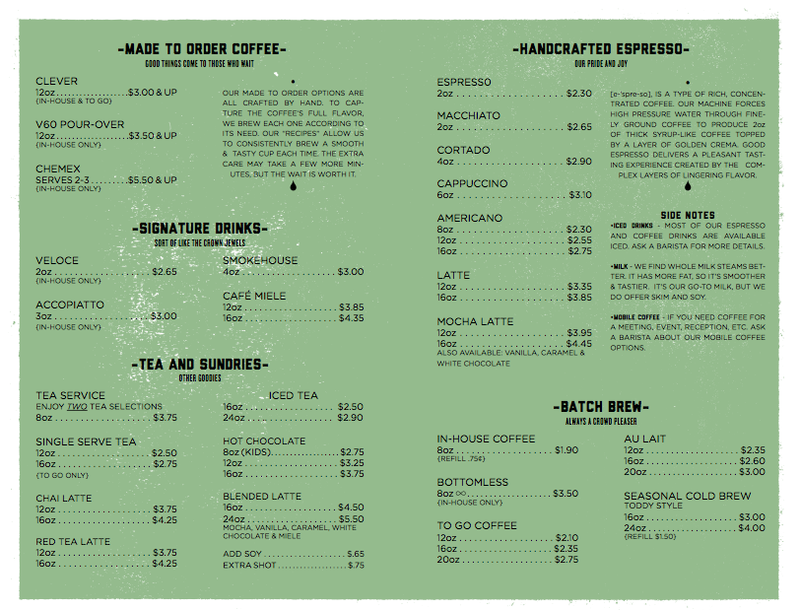 Necessary to these steps forward come some adjustments to our menu and prices on some of the coffees and drinks we offer. These changes reflect our commitment to doing everything we’ve said above now and for the long haul here in Louisville and beyond. As with anything that truly adds value to our lives, there is a price. But we believe it is a price well worth paying as we see coffee continue to reveal its place alongside the prized craft foods, beers and wines that already enrich our lives. It is Quills' great desire to be a part of this particular devotion to excellence for a long time to come. Additionally, we know we all hope to see the many great innovators and artisans who partner with us and grow our coffee achieve long-­ term success for their farms and families. With those goals in mind, we have taken several months to analyze the data in order to discover where price changes are needed and where they can be minimized or avoided. We have also made every effort to minimize our costs by running a prudent operation and securing the best possible prices from the vendors we work with. Every change has been decided upon carefully. At the end of the day, we think you will find that none of the price changes are dramatic, and all reflect the constantly evolving value of what Quills Coffee provides. To say it all in brief: Slight bumps in prices mean higher leaps in coffee excellence. That’s not a bad trade off. Below you will find a copy of our new menu, with a few notes pointing out significant details. These changes will go into effect on April 4th at all 3 of our locations. We recommend a V60 of Finca Los Congos while you read. Older PostSt. Patty's Day Online Sale!